Posted in: Uncategorized. Tagged: Brexit, chart, in, Leave, map, out, Stay, votes, voting. It appears the Leave campaigners have managed to pull in more voted than Stay. The margin was astoundingly low at 1.9 per cent, equating to approximately 1.4 million votes. 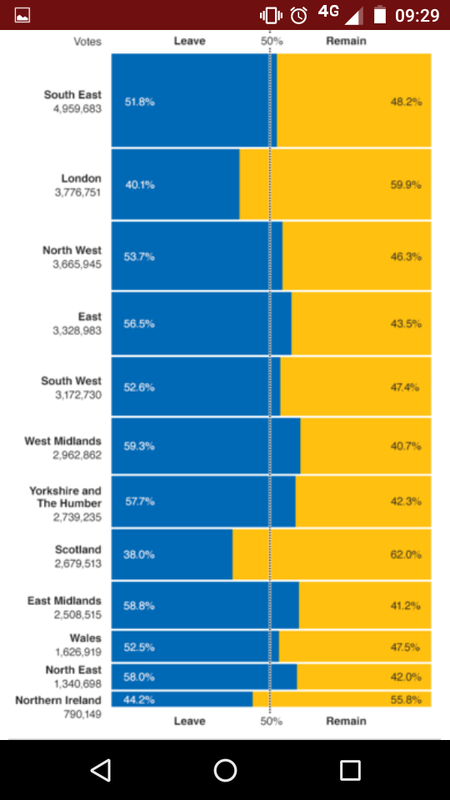 Here is a graph on how people voted across different British regions. There has been an outburst of insults across the web today from the 48.1% of Stay voters, so much so I have logged out of Facebook as it’s depressing to be referred to as idiotic, racist, bigoted, hateful, foolish, stupid, c words, f words, and other horrible things as I consider myself a loving gentle person , who makes daft videos and photos to bring a smile to a person’s day. A martyr to the web design industry as I’ve never charged extortionate monthly fees like others. Charitable, caring, and friendly.